Last year,, mogul fashion house D&G made what Forbes noted was their "smartest move in years", when they launched a new collection of abayas and headscarves under their label. D&G is repeatedly being hailed as 'progressive' and their announcement is supposedly an exciting development in the fashion realm, but for some Muslim women, there is nothing exceptional or remotely noteworthy about this line at all. Why should D&G be applauded for something that is at its core, primarily just a calculated business move devoid of any real intention to change the fashion world to be more inclusive of its Muslim audience? When you take into account the fact that D&G operates about 13 stores alone in the UAE and numerous others in the surrounding Gulf States along with the fact that the sale of personal luxury goods in the Middle East hit $8.7 billion in 2015 -- up from $6.8 billion the year before, it's hard to see where the sincere push for newfound inclusivity and not that of monetary standing comes in. Don't forget too, that the models who sport the collection in the ad campaigns are all white, non-Middle Eastern, non-Muslim women. That alone should say a lot, but it's what many people miss. Essentially, D&G are (as most Western neoliberal capitalists would) monopolizing something that does not belong to them. They are profiting from the pseudo "incorporation" of a cultural and religious piece of clothing into their line that normally, they would take offense to and would label as an oppressive uniform. In fact, the majority of the Western world would consider the abaya and the headscarf as items of clothing that supposedly rid women of their personal agency. We hear this argument time and time again when it comes to the dress choice - keyword: choice - of Muslim women. Yet when you sprinkle some crystals to the sleeves, stitch some lace to the fringes and stamp your name, label, and price tag on it, it's seen by the mainstream media as "fashionable", "beautiful" and not "oppressive" or "backwards." Another problem that the fashion house is posing with its new collection is that it is marring the line between the Middle Eastern consumer vs. the Muslim consumer. The two are not the same, but according to D&G, culture and faith are the same thing. It's quite clear that the fashion line is being marketed to the wealthy cohort of Middle Easterners in the Gulf and Arab states as opposed to the millions of Muslims living in the other parts of Asia, Africa, Eastern Europe, and the West. Why is the world so taken aback and amazed by D&G's move? Why is there no mainstream or high end coverage or inclusion of the hundreds of Malaysian Muslim abaya fashion designers or the thousands of British and North American Muslim fashion bloggers and designers that have been pushing for inclusivity and representation in the fashion industry for years? Why does no one talk about how Muslim women are already fashioning their abayas in highly creative and chic ways? Why has D&G reduced Muslim women to just abayas and headscarves? Why is there not an effort to create and incorporate more innovative and varied pieces that Muslim women can choose to wear? 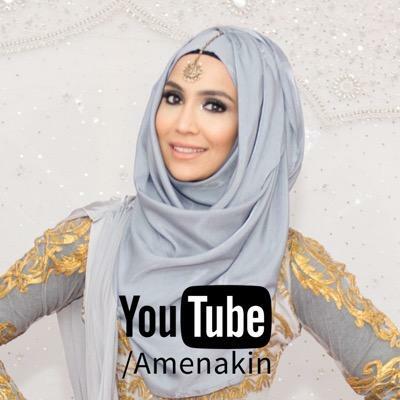 Amena Khan, British YouTube blogger, entrepreneur, face of new Loreal campaign. NYmag made it a point to say that, "what stands out in particular about Dolce & Gabbana's take is that it gives the lie to the idea that one can't follow trends and have fun with fashion while also following a religious dress code." They also mention that, "'modest' doesn't have to equate to dowdy, boring, or head-to-toe neutrals. It's not just about lowering hemlines and extending sleeves, but preserving the runway aesthetic that got everyone so excited in the first place." As offensive as it sounds, apparently "modest" fashion in the eyes of these high end fashion 'experts' seems to be synonymous with "boring" and "dowdy." Which is exactly the problem because the reality is quite the contrary, but here you have D&G presenting a case that suggests that without these Western labels, Muslim fashion is just boring. As shown in the above photo of Ibtihaj Muhammad's piece, Muslim designers' creations are far from boring. On the contrary, actually. We are the ones who can anticipate our needs and tastes, not some multibillion dollar corporation that never cared about us til today. This subtle propaganda distorts the narrative that some Muslim women in the fashion industry are trying so hard to engage in and change. "I feel like I should be happy, ecstatic even, perhaps eternally grateful? That's what seems to be the general reaction to this news so far. But, I can't help but feel incredibly underwhelmed, possibly even a tiny bit insulted by the collection. I've dreamed the day a major design house would officially recognize us, hijab clad muslim women and finally 'cater' to us. But my dream wasn't resulting in a line of lacey, embroidered traditional abayas and matching scarves. Something I've grown up with and a look that every Muslim woman is all too familiar with. Something that the local 'abayas r us' in Brummy might have. Or if you fancy something a little more luxury, 'abaya gold' in Dubai would suffice. I dreamed of being able to look at signature gowns on the runway and imagine myself in one, hijab and all. I dreamed of being included in the mainstream of haute couture & whilst D&G have managed to recognize us with this collection, they've also managed to exclude us. 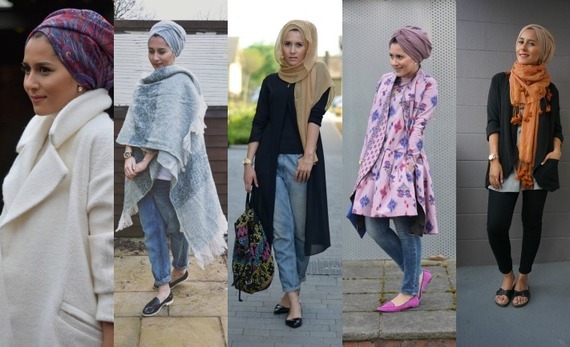 Fashion conscious Muslim women in the form of bloggers, designers & stylists have been taking centre stage for a good few years showing the world that modesty & style can coincide with faith. With barely a nod of applaud or recognition, until D&G fancies putting their stamp all over a very traditional middle eastern style & claim it's originality. So Thank you, but no thank you." So just as the world is celebrating what might seem like Muslim inclusion with D&G's new line, they also fail to acknowledge the fact that we've been once again, excluded and marginalized by the Western man under the guise of their "progressive thinking." Nothing new there. Regardless of what side of the argument you're on, if you take the brand name off the abayas and hijabs, you'd be left with what is already in the market but is never acknowledged or celebrated to the same degree. Muslims need true representation and inclusion in the fashion industry and that won't happen just because two Italian billionaire designers decided to start selling over priced abayas and hijabs in 2016. It will happen when mainstream media and fashion platforms actually listen to and engage with Muslim women and Muslim designers and models instead of stamping their own name on what we've been seeing forever.